Analyze multilevel networks as described in Lazega et al (2008) and in Lazega and Snijders (2016, ISBN:978-3-319-24520-1). The package was developed essentially as an extension to 'igraph'. 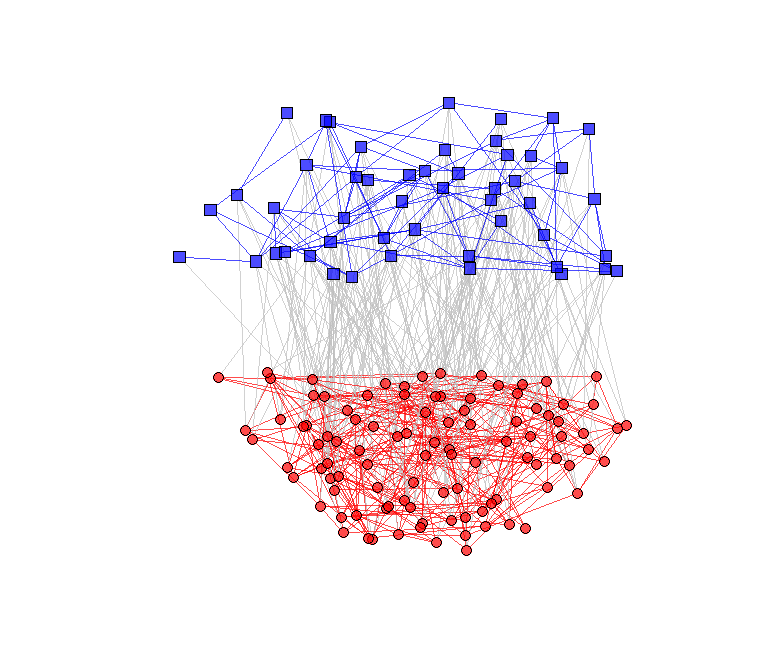 multinets is an R package that provides tools to visualize and analyze Multilevel Network Data. It was built as an extension to the igraph package. As a basic example, we will plot a multilevel network. We are going to use linked_sim, a simulated multilevel network dataset. bug fix - correct package imports in DESCRIPTION file ("igraphdata"). enhance set_color_multilevel. Cpp code set colors to nodes and edges. small enhance set_color_multilevel using cpp. Cpp code only sets colors to nodes, not yet to edges. bug fix - issue #1 - fix if statement with condition length > 1. Changed chain of if statements in mode_transformation to a switch and included an error raise when which argument is missing. enhance set_shape_multilevel performance with cpp code. include Rcpp in the project.